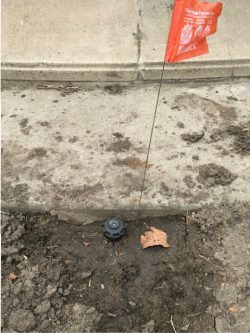 If you have been by The Circle in recent days, you may have seen city crews at work digging and planting locator flags on the center island and the surrounding parking strips. They have been carrying out various pieces of long-planned projects, some of which are finally coming to fruition. Following on the heels of the recent resurfacing of The Circle roadway, the work has made the area look somewhat in disarray, but things should look much better soon, just in time for the holiday season. Some small followup adjustments to the drainage project will require draining the fountain to carry out, and will happen soon (right now, scheduled for Friday, Nov, 3). FOFW volunteers will take advantage of the fountain being dry to give it a thorough cleaning on the regular monthly work day, Saturday, Nov. 4. 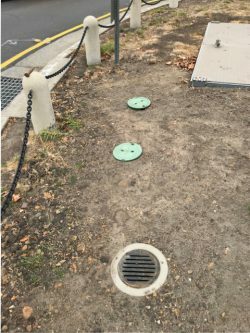 The other project that has required digging has been repairs to the irrigation system that waters the island and the surrounding lawn areas (parking strips and areas that front the balustrade). (See the picture at left of a new sprinkler head.) It is being brought up to speed to make sure it working in time for the next big project: the planting of those areas with new fast-growing, drought-tolerant groundcover in place of the very tired old sod. Crews should be out the week of Nov. 6 to dig up the old sod and begin planting two similar-looking groundcovers: Kurapia and Dymondia. Kurapia (that’s an image of it at the very top of this post; see information about it here) will be planted on the center island and in the parking strips; Dymondia (see information about it here), which is less invasive, will be planted in place of the sod that fronts the boxwood hedges along the balustrade. The hedges will remain. These hardy new ground covers should stay green year-round and require no mowing and little maintenance. The repaired irrigation system will be used to help them get established. If all goes according to plan, one more major renovation on the center island will happen that same week: The installation of new doors to the vault that contains the fountain pumping and lighting systems. For years, city staff and volunteers have struggled with the very heavy and cumbersome vault doors while accessing the below-ground fountain works (see photo of current doors at right). Those doors will now be replaced by doors with a “torsion-assisted mechanism” that will make them easier and safer to open and close, and allow for the space to be vented. All this work should be completed in time for the annual decorating of the fountain for the holidays. It will get its makeover in early December and wear it through early January. If you haven’t seen it dressed up before, here is a photo of the evergreen-wreathed bear cubs from a past holiday season. Finally, as part of FOFW’s ongoing maintenance of the fountain, we recently obtained and installed a new nozzle for the very top of the fountain. Fabricated by a Berkeley machine shop, it replaces a previous nozzle that had worn out from use. As you can see in the image below, the new nozzle allows for a dramatic crowning shower. Thanks to the City of Berkeley for all its attentiveness and hard work in bringing these projects to fruition. And thanks, as always, to all the Friends of the Fountain and Walk. If you haven’t yet joined as a donor or volunteer, please consider doing so today; you can do so here. FOFW is only as strong as the community that it is part of. Hi, Thank you for all of the explanations of the major improvements to our wonderful fountain. Please note…what I am writing next is not a complaint; it is a suggestion. 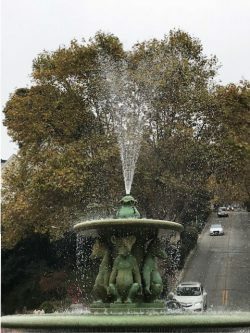 As someone who has lived near the fountain for over 40 years, I love to see the water spraying and enjoy the fountain. 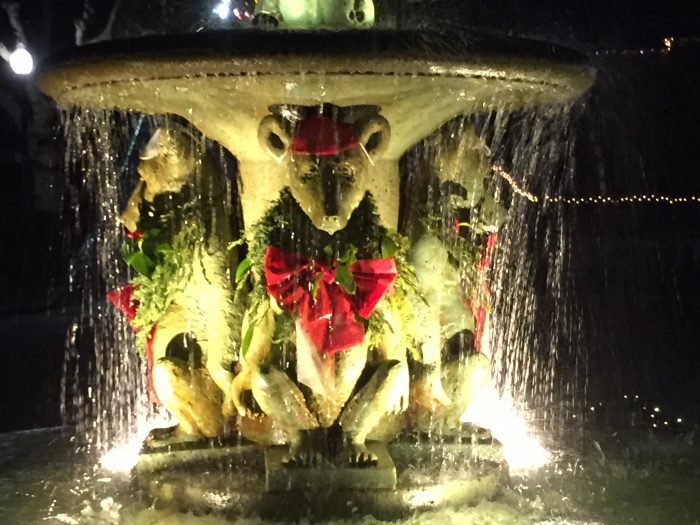 However, when December rolls around, the fountain is always decorated for Christmas…and, yes, it looks very festive. Please note: Here is my suggestion…. Please add some Hanukkah decorations for those of us who do not celebrate Christmas. Many thanks!!! Thank you for the update. Dennis & Christine McIntyre (40 San Mateo Road) are so pleased with all that has been, and will be done to improve our lovely fountain and its surroundings. We remain committed volunteers of FOWF.